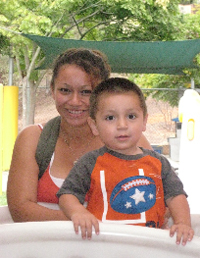 Learn about UC San Diego's campus child care solutions. Full-time care is available at the Early Childhood Education Center for children 3 months to 6 years old. Full- and part-time care is available at Mesa Child Development Center for children 3 months to 5 years old. San Diego Centralized Eligibility List: "Connecting families San Diego County to subsidized early care, early education and childcare programs." This is a one-stop application for several subsidy programs for child-care centers, home daycare and babysitting across San Diego County, some of which are close to UC San Diego. Visit www.childcaresandiego.com. UC San Diego Grad Parents Network Mom's Support Group. This group is run by students and is open to all student-parents, including undergraduates, as well as to family members, partners and spouses. If you're thinking about attending UC San Diego, get on child-care center waitlists early! Use the resources listed above to find supplemental and back-up options in case a UC San Diego child-care option doesn't work for you. For more information, contact the Early Care and Education Center.